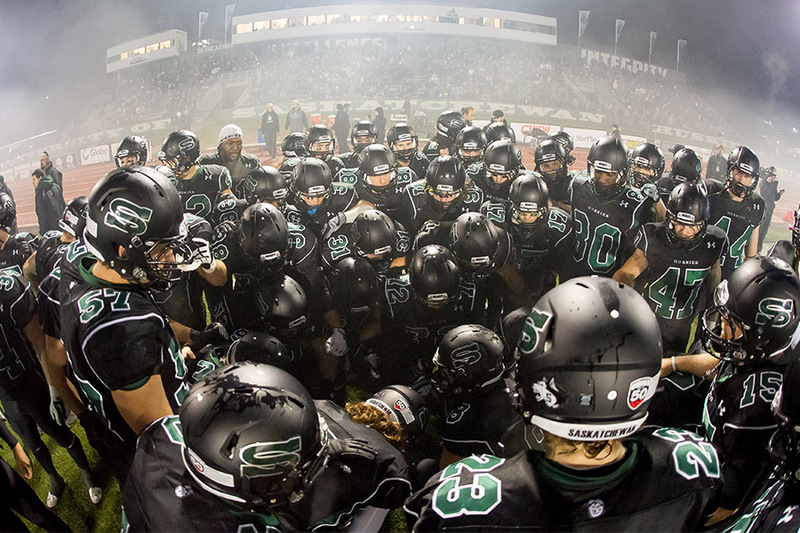 Just as the University of Saskatchewan has garnered national acclaim for groundbreaking research, the Huskies have also earned a reputation for success on the fields, courts, tracks, mats and ice. Under the direction of U of S Athletic Director Basil Hughton, the Huskies have a track record of achievement that rivals any school in the country, becoming a source of pride for students, staff and alumni, and producing priceless publicity and national profile for the university. "I think our Huskie brand is certainly well known across the country, and the success of our teams speaks for itself," Hughton said. "We hosted 16 playoff games here last year, which I'm not sure too many of our counterparts across the country could boast. Obviously we see ourselves as a top-echelon university athletic program and I think that in itself leads to a whole bunch of positive marketing and public relations opportunities for our university." Hughton said he continually asks what is the value of a strong vibrant athletic program to the culture of a Canadian university. And he knows the answer. "I believe it is enormous in terms of public relations, branding, and the amount of generally positive media that we get. If our university had to go buy those column inches in advertising, that expense would be unaffordable. It wouldn't happen." But what has happened is the U of S basking in the spotlight as current and former players and coaches represent the university on the national and international stage. This summer alone, former Huskies women's soccer player Kaylyn Kyle brought exposure to the program while playing for the national team in the Women's World Cup, while dozens of former Huskie football players are suiting up in the CFL. Earlier this month, the Huskie name was also front and centre as U of S women's basketball coach Lisa Thomaidis guided the national team to a gold medal in the Pan-Am Games and a berth in the 2016 Summer Olympics in Rio de Janeiro. "For her to be the coach of the national team and to represent our nation at the Olympics as the head coach in Rio in 2016, is incredible for her," Hughton said. "And we're extremely proud of her and extremely blessed to have her in terms of the success that she has had, not only with the national team but the success that our own program has had with her, going to nationals eight of the last nine years." With a new season upon us, Huskie student-athletes—more than 400 on 15 teams in eight sports—are gearing up for another shot at nationals. For Hughton, watching the student-athletes begin training camps is always his favourite time of the year. "Once the athletes are fully engaged and back, that's when the excitement truly begins and in all honesty it's why I do what I do," he said. "It's all about the young people and trying to provide the best possible experience that we can for them here at the university and to give them the best possible environment so that they can succeed, both as students and as athletes." Building on last year's successes, Hughton is confident a number of Huskies teams will also be contenders again this season, including football, the always-competitive soccer squads and women's basketball. "I start the year always believing that all of our teams have an opportunity to get to the national stage," Hughton said. "We certainly hope for that. I have completed seven seasons here as the athletic director and I have been to 15 national championships with our teams, and that doesn't include wrestling, track and field, and cross-country, where we go every year." The Huskie football team—a perennial national contender under head coach Brian Towriss—kicks off the season battling the Manitoba Bisons in the annual Homecoming Game on Sept. 4 at the 6,000-seat Griffiths Stadium. With 15 starters returning and a strong recruiting class, the fireworks on the field are sure to match the fantastic fan-friendly pyrotechnic displays at the end of each game, courtesy of long-time donors David Dubé—a Huskie alumnus—and his wife Heather Ryan. "At Huskie football home games, we are in the entertainment business and we try to entertain," Hughton said, noting the club will also again honour the Canadian Armed Forces on Sept. 18 in a game against the University of Regina Rams. "Our goal is every client, every customer, every fan leaves with a smile on their face."